The Neptunian system system contains several smaller, irregular moons that we know very little about. These moons are extremely small, and most were not discovered until the Voyager 2 encounter with Neptune in 1989. Because of their small size, it is possible that some of these moons may be captured asteroids or comets. These recent discoveries bring the total number of Neptunian moons to 13. Below is a listing of some of the largest of these moons in the order of their distance from Neptune. The image accompanying each description is the best available at this time. You may access information on one of the moons directly by clicking on its name below. Naiad [NAY-ed] is the innermost moon of Neptune. It was named after mythical nymphs who lived in springs, brooks, and fountains. Naiad was discovered by Voyager 2 in 1989. It was the last of the new satellites to be discovered during the Voyager 2 encounter with Neptune. 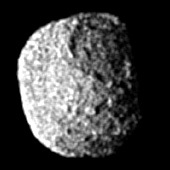 Naiad has an irregular shape and shows no sign of geologic activity. The only available image of Naiad appears elongated due to smearing from the high speed of the Voyager 2 spacecraft. Very little is known about this small moon except that is circles Neptune in the same direction as the planet rotates. Thalassa [tuh-LASS-eh] is the second of Neptune's known moons. It was named after daughter of Aether and Hemera. Thalassa was discovered by in 1989 by Voyager 2 during its encounter with Neptune. It has an irregular shape and shows no sign of geologic activity. The only available image of Thalassa appears elongated due to smearing. Not much is known about this moon except that it circles Neptune in the same direction as the planet rotates. Despina is the third moon of Neptune. It was named after a nymph who was the daughter of Poseidon and Demeter in Greek mythology. Despina was discovered by the Voyager 2 spacecraft in 1989. It is irregularly shaped and shows no sign of any geologic activity. Despina orbits Neptune in the same direction as the planet rotates, and remains close to the planet's equatorial plane. Not much else is known about Despina. Galatea [gal-eh-TEE-eh] is the fourth of Neptune's moons. In Greek mythology, Galatea was a Sicilian Nereid loved by the Cyclops Polyphemus. This moon was one of several discovered by Voyager 2 in 1989. Galatea orbits Neptune in the same direction as the planet rotates, and remains close to the planet's equatorial plane. It is irregularly shaped and shows no sign of any geologic activity. Not much else is known about Despina. The only available image of Galatea appears elongated due to smearing. Larissa [LA-ree-suh] is the fifth known moon of Neptune. It was named after a daughter of Pelasgua in Greek mythology. The discovery of Larissa is usually credited to Harold Reitsma in 1982. Larissa is irregularly shaped and appears to have a heavily cratered surface. It shows no signs of geologic activity. Larissa orbits Neptune in the same direction as the planet rotates, and remains close to the planet's equatorial plane. Not much else is known about this moon. 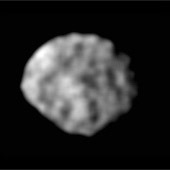 Proteus [PROH-tee-us] is the sixth of Neptune's moons and is the second largest. It was named after a mythical sea god who could change his shape at will. Proteus was discovered in 1989 by the Voyager 2 spacecraft. It is irregular in shape and is probably about as large as an irregular body can be before gravity pulls it into a spherical shape. Like Saturn's moon, Phoebe, Proteus is extremely dark in color. It reflects only 6% of the sunlight that strikes it. Proteus is larger than Nereid, but was discovered much later because it is so dark and so close to Neptune that it is difficult to spot in the planet's bright glare. Its surface is heavily cratered, and shows no signs of geologic activity. Nereid [NEER-ee-ed] is the eighth and outermost of Neptune's moons and is the third largest. It was named after the sea nymphs who were the daughters of Nereus and Doris. Nereid was discovered by Gerard Kuiper in 1949. It reflects about 14% of the sunlight that strikes it. This makes it a little brighter than Earth's moon and more than twice as reflective than Proteus. 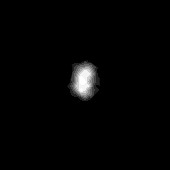 Nereid is famous for having the most eccentric orbit of any moon in the Solar System. Its distance from Neptune ranges from 841,100 miles (1,353,600 km) to 5,980,200 miles (9,623,700 km). This odd orbit suggests to some astronomers that Nereid may be a captured asteroid or Kuiper Belt object. Not much else is known about this moon.